Downforce is the latest extreme racing game from Titus that have been almost been in the world of gaming since day one. The game features some futuristic heart-pumping adrenaline style racing that is sure to impress gamers worldwide. As there are almost hundreds, well dozens of formula one type games on the market at the moment, Downforce is one of those rare games that has decided to add their own unique twist into the world of racing. Although Downforce is set in the not so distant future, you now control these formula one cars that go in excess of 200 miles-per hour and when they hit another car or concrete, you can be assured that result will be spectacular as Downforce features some of the best looking crashes on any game. 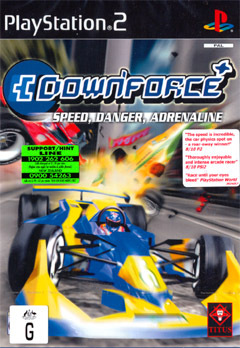 Downforce features a variety of different gameplay modes that include Trophy, Championship, Time-Attack, Free Race, Time Trial and two multiplayer modes. Downforce also contains eight different courses that you can race on that include cities from Tokyo Japan to Sydney Australia. The main method of gameplay is the Championship mode that has you competing against nine other drivers to become number one in a six-track racing season. There are 14 different cars that can you choose from that range from dual turbo V8 engines to the highly powerful and dangerous V12 engines that not only sounds impressive but can really blow your competitors away. The further you progress into the game, the more cars and bonuses you will able to unlock such as nitrous oxide and various upgrades for your car. The multiplayer mode (two player) in Downforce is brilliant and feature two different types of gaming modes that include Time Tag and Free Race. Free race is basically a standard race among the circuits you have unlocked, whereas the Time Tag has an interesting twist. The premise behind Time Tag is to hold a ten second lead on your opponent and if you manage to succeed, you are awarded one point. Also, if you crash your car, the opponent is awarded one point so the morale of the story is, try to ram your opponent from the road. The control system of Downforce is quite straightforward and uses a combination of the analog stick and the d-pad for some extreme racing fun. 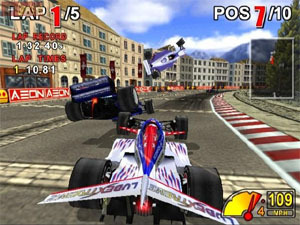 The beauty of the gameplay in Downforce is the intelligence of opponent drivers that perform a variety of moves such as overtaking in the inside, blocking you and various other techniques to sabotage your race. Graphically, Downforce reminds me of those old arcade racing games from the 1990's. That is, all the tracks have wild designs that are extremely colourful and cartoony. The developers have gone to extreme lengths to feature some of the best looking backgrounds to have ever graced a PlayStation 2 game. Everything from buildings, trees, clouds and explosions has been done brilliantly. The best part of Downforce is that the game runs at a perfect 60 frames per second with minimal slowdown. The cars also contain a fairly high polygon count for some realistic looking models and some great texture details. 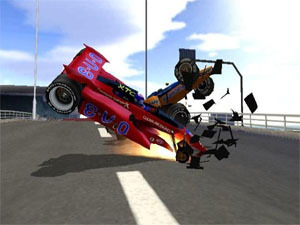 One of the most impressive features of Downforce are the spectacular crashes that are almost better than Burnout 2. When a car hits another car or concrete, the cars flies high in the air and breaks apart, depending on how bad the crash is. After completing a race, you are also treated to some great replays that are extremely reminiscent of the formula one telecast. The only downside of the Downforce is the uninspiring soundtrack that sounds very stock standard and nothing really to write home about. 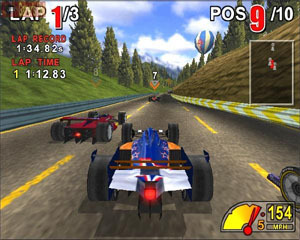 Fortunately, the sound effects in the game make up for the soundtrack and feature all the roars and screams of futuristic formula one cars. Those that are looking for a race simulator should look elsewhere because Downforce is pure arcade fun that not only pays homage to the arcade games of yesterday but also brings this genre into 21st century gaming. With great graphics, amazing gameplay and some great sounding engines, Downforce is the perfect game for a quick race or a season of fun! Check it out!